The Adventures of Compost Calzone in the Wild West! Julie used to make these amazing calzones with chicken, spinach and cheese. Something like this recipe except she would use our own ingredients and make the dough herself. Out of this world! Those are, apparently, not a part of the menu these days. Sigh. So what is a calzone? 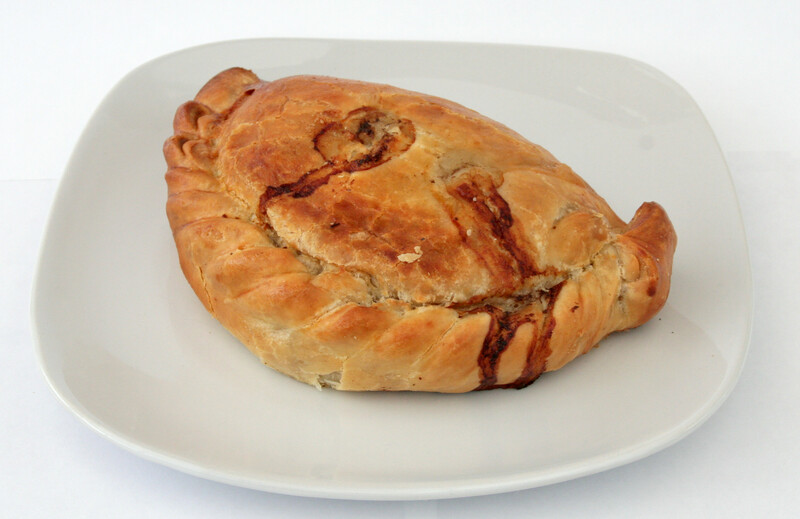 It’s sort of a pie. There is a layer of bread surrounding the good stuff. Maybe more like a sandwich that is all sealed up. 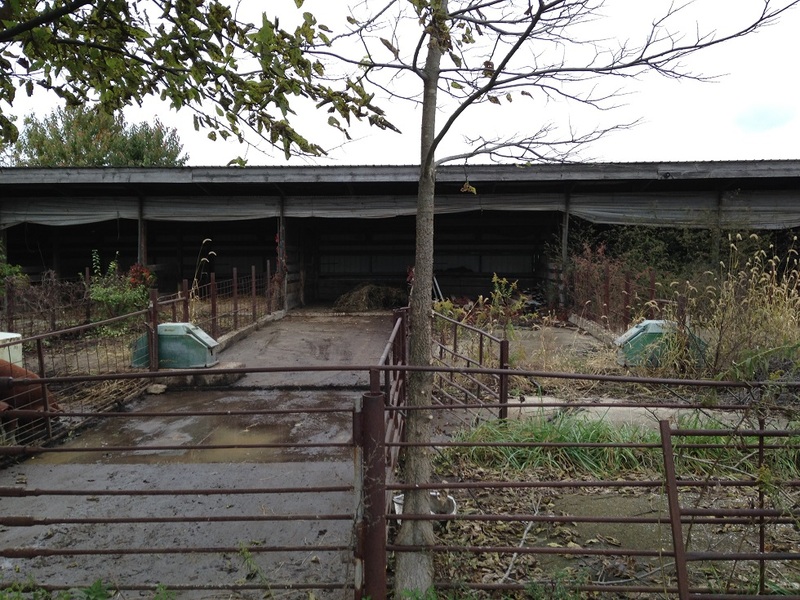 The pigs are currently cleaning up a poriton of an overgrown hog lot for me. There are 20 years worth of grass and trees growing and virginia creeper out there. 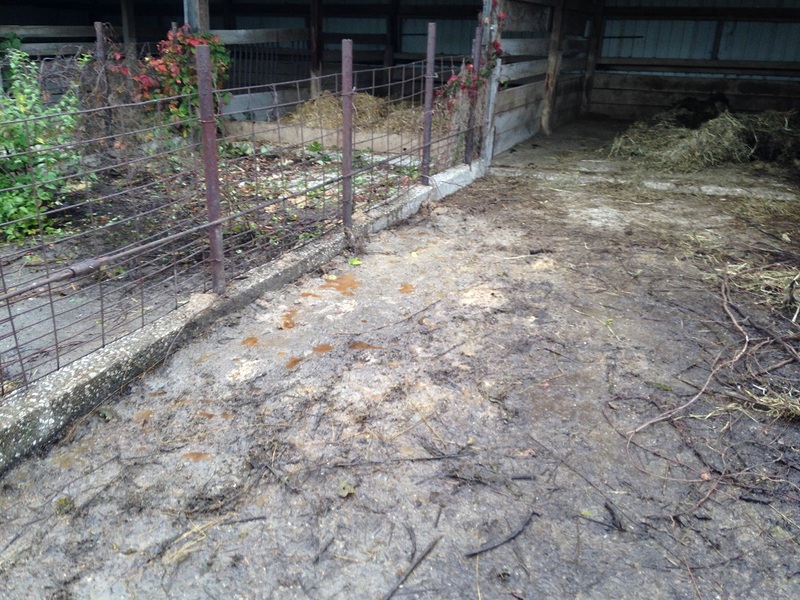 The pigs do a good job of rooting through that mess and adding manure. My job is to clean it up and make the most of what remains so I am making compost calzones. 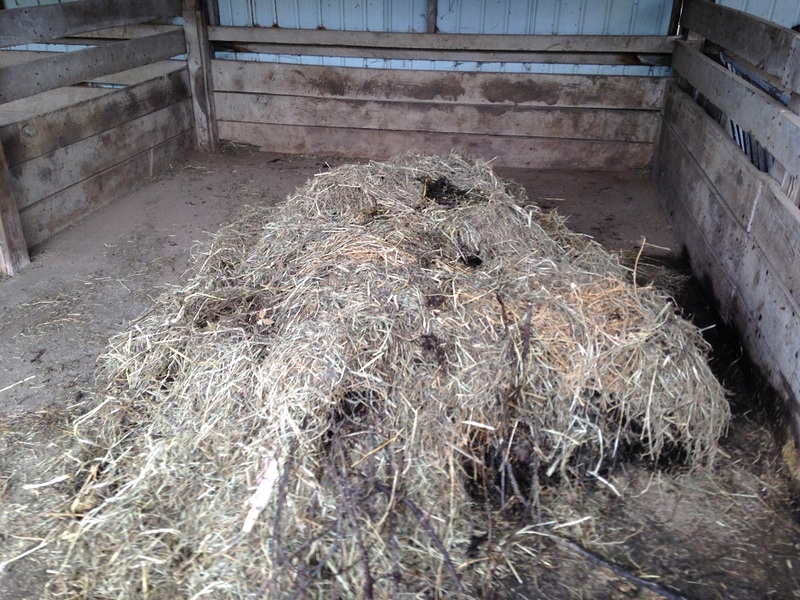 The pigs need a dry, warm place to lay down and take a nap so I fill the shelter with two bales of straw. That’s the bread of the calzone. When I move the pigs to their new pen I gather up the bedding into a pile in the center of the shelter. I do this because I want the compost covered so my nutrients stay where I want them. I can’t let anything wash away. So I make a little nest of the bedding material in the shelter. Then I begin scraping the concrete and pile the wet mess from outside into the shallow center of that nest. Shovel by shovel, scrape by scrape, I fill the nest in. Now, there is a little family secret to helping this recipe turn out well. I may as well tell you. Bring in a little extra material to cover the top. Today I used a little spoiled hay but whatever is handy works. With the pile covered, begin working your way around the pile with a pitchfork, folding the surplus material from the edges up over the top of the pile. This is not in any way a technique of my own design, I read about it in Just Enough (a book I highly recommend). Farmers would bring a wagon into town and fill layer after layer with straw and (Gasp!) humanure, sewing the edges of each layer up under the layer above, trapping all the…um…juices…within. The goal was to return nutrients to farms rather than allow farm soils to deplete while nutrients are concentrated and trapped in the cities. They would pay more to clean out the latrines of wealthy people as their diet was better and their manure was richer. So, following their example, I trap the moisture within to help it all compost nicely. Well…somewhat nicely. To be honest, this wasn’t the nicest compost calzone I have ever cooked but the end result tastes just as good. This is a nicely contained compost pile made of straw, pig manure, leaves, dirt, grass and vines under shelter and the concrete pad is clean for the first time in decades. Once the composting action begins the pile will heat through from the inside. When it begins to cool (3 days…maybe a week) I’ll tear it apart and put it back together again. After our compost pile goes through a few heat cycles I’ll send it out to feed our fields. I know I can do better though. I know I can catch more nutrients, make pigs happier and do less work. We may even find a way to use this silly hog floor more frequently. I just have to keep applying myself to the problem. And buy a loader. Good luck with your calzones, chicken or compost. 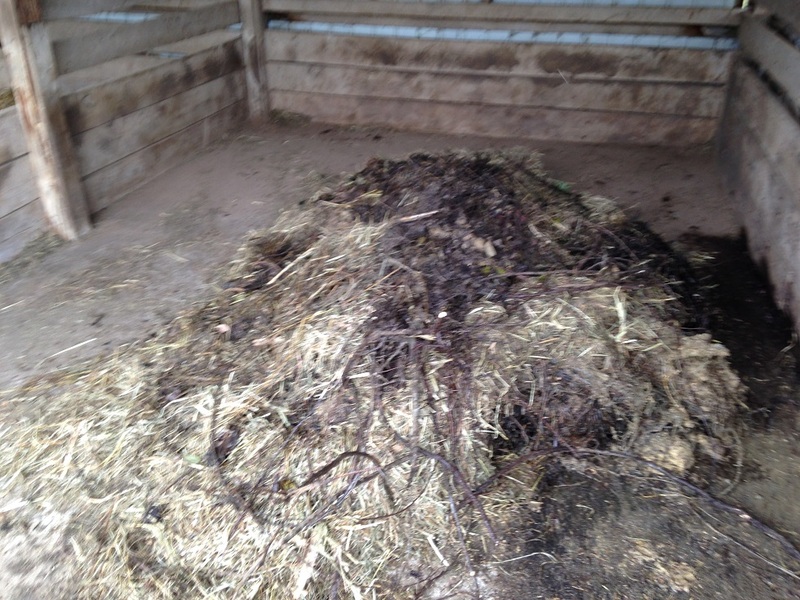 This entry was posted in Composting, Pastured Pork. Bookmark the permalink. I did a search of the Cargill floor and it seems to have been popular for a bit in the ’70’s. It’s nice to see you making use of what you have. It made me think of deep bedding some meat birds on some concrete I have out back.